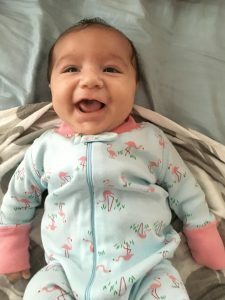 My wife and I celebrated the birth of our first child in March 2016 and I thought it would be a good idea to discuss how I, an estate planning attorney, would start getting my estate in order. I can tell you that having your first child is definitely a strong motivating factor to get your affairs in order. Many people in this situation are spurred by a fundamental question – who will take care of my child and my financial assets if something happens to me and/or my wife? However, that is not where I am starting. Rather, I want to start with love and I want this to be the driving force behind my estate plan. I want to make sure I capture certain memories so that I can pass them on and share them with my daughter, Nava (picture right). Why not start from the beginning? As I anticipated my daughter entering the world, I felt nervous and a lot of excitement. On the one hand, I worried if she would be healthy and if I had what it takes to be a good father. On the other hand, I could not wait to see her face and hold her. I knew my parents raised me well and emphasized the importance of character and strong values. Also, I knew my wife Newsha has equally strong values and character. Having this background gave me tremendous confidence as we were awaiting our daughter’s arrival. I was present in the delivery room when Nava was born. As an athlete, it was like being in the locker room before a big game. We worked so hard to prepare for this moment and now we were on the goal line. My heart was beating fast and it didn’t really hit me until just then that the little baby my wife was carrying for 9 months would be in our arms soon. I couldn’t help but smiling and thinking that I wish my dad was here to see this. My dad had the best smile that would light up the room. I knew now where that wonderful smile came from as I couldn’t contain myself with genuine excitement and joy. We were lucky enough to have my mom present in the room to see the birth of her grandchild. That meant a lot to me and I hope Nava realizes the magnitude of her being there. My mom is a legend in her own right and that is a story for another day. When I first saw Nava and held her in my hands, there was a rush of adrenaline that went through me and my voice was shaking with genuine love. I kept saying how beautiful she was and I thought about how hard my wife Newsha worked to get to this moment. Your mom chose your name for you many years ago. As a child, your mom always liked the name Nava. The English translation is “music.” When I heard the name, I thought how beautiful and perfect it was. There was no argument from me. You definitely are music to my ears. However, I chose your middle name “Seneca” which comes from an Iroquois Native American tribe. The sport of lacrosse has been a big part of my life and it was invented by the Native Americans. I thought it would be nice to share that background with you. I will leave it to you if you are interested in the game. I just thought I would give you a head start. So here is where I am starting my plan. I want to start with values and stories. I will continue building the plan and I will continue to share my progress. I feel this is the best project in the world. It should, and will not be, a transaction. Estate planning is about family, values and love.